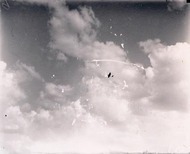 Bert Hinkler's Avro Avian aircraft ready to land. 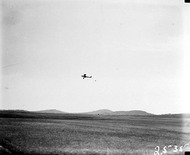 RAAF Aircraft in flight at the Royal Review. 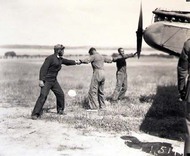 Biplane (G-AUCA) with two people. 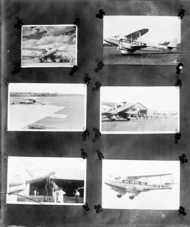 Six photos of De Havilland DT 1 biplane of Qantas Empire Airways VH-USC. Aircraft landing on the review grounds in front of the Kurrajong Hotel. 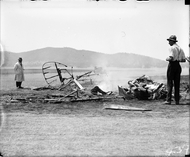 Aircraft crash showing engine. 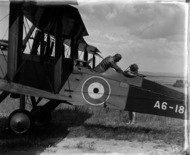 Single seat Scout Experimenter prefix A2 crashed at the opening of Parliament on 9 May 1927 on Rottenbury Hill at the site of St Marks Church, Blackall Street, Barton. Pilot Flying Officer EWEN was killed and is buried in St John's churchyard. 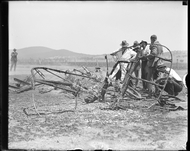 See Canberra Times 13 May 1927 for details. 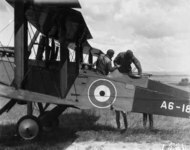 RAAF De Havilland DH9 2 seater aeroplane. Flight to Central Australia. Biplane VH-UEZ. Visit of Imperial Airways Airliner ASTRAEA on a survey flight for proposed air mail service with dog and spectators. 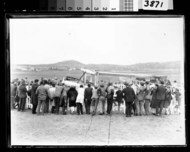 Visit of Imperial Airways Airliner ASTRAEA on a survey flight for proposed air mail service with spectators at Duntroon landing ground. Visit of Imperial Airways Airliner ASTRAEA on a survey flight for proposed air mail service. Sir Isaac and Lady Isaacs beside the aircraft. Bert Hinkler with a group of Army Officers at Duntroon House. Second Conference of 65th District of Rotary. Delegates arriving in the aeroplane called 'Canberra', a De Havilland 61 Giant Moth. Arrival of Captain W.N. Lancaster and Mrs Keith Miller in aircraft "Red Rose" at the Review Ground opposite Hotel Kurrajong. Captain W.N. Lancaster and Mrs Keith Miller landing their Avro Avian G-EBIO "Red Rose" at the Review Ground opposite Hotel Kurrajong. Royal Visit, May 1927. RAAF DH9 aircraft taking off. Aircraft VH-UEZ, biplane in flight. Royal Visit, May 1927. King George Terrace and Parliament House looking east showing flagpoles and young trees. RAAF flight overhead. Arrival of Captain W.N. Lancaster and Mrs Keith Miller at the Review Ground opposite Hotel Kurrajong, aircraft taxing after landing. Landing of Captain W.N. Lancaster and Mrs Keith Miller aircraft "Red Rose" at the Review Ground opposite Hotel Kurrajong. Crowd welcoming Captain W.N. 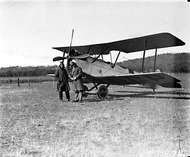 Lancaster and Mrs Keith Miller and their Avro Avian aircraft G-EBIO at the Review Ground opposite Hotel Kurrajong.